We have the opportunity to serve at the Provo MTC and one of the things we do is to host the senior humanitarian and welfare mission couples as they are trained for four days. One of the couples we were able to host a few months ago were Elder and Sister Buell who were on their way to Indonesia. If you want to share their great experiences just check their blog and enjoy! This entry was posted in Mission - Indonesia on April 25, 2017 by Bill. In 2007 we were given the opportunity to set up and teach what became an Intensive English class for qualified Indonesian returned missionaries. They got to come into Jakarta and for a month spent all day and some nights improving their English through reading, writing, and speaking English. They were chosen because they already had good English skills but needed to improve if they were going to go to BYU Hawaii or get better jobs where excellent English was required. Now some 7-8 years later we can look back and see how these classes helped those we have been able to keep in touch with. Many have been married in the temple and now have children. Others have gone to BYUH and are now using their skills in their employment. Like Ammon in the Book of Mormon…”I do not boast in my own strength, nor in my own wisdom; but behold, my joy is full, yea, my heart is brim with joy, and I will rejoice in my God.” What a blessing it has been to serve each of our missions. In each case the Lord has given us amazing opportunities to grow spiritually by helping others like the 19 young people that are pictured here…you will notice that Sam, our driver, is in each of the pictures because he got to attend all of the classes. This entry was posted in Johannesburg Mission - Back To Africa, Mission - Indonesia on November 17, 2014 by Bill. 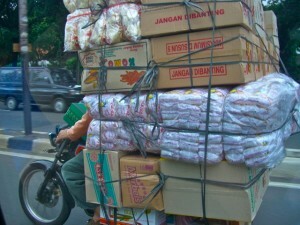 While in Indonesia I took many, many pictures of motorcycle and bicycle loaded with just about anything you can think of. Sometimes it would be people – someone told me they once saw 8 on one motorcycle but I never saw more than 6. 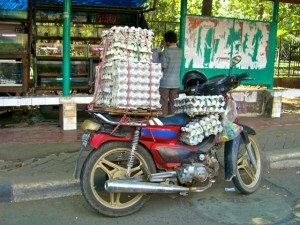 I can not find one of my favorite pictures – a motorcycle carrying live chickens hanging off the back fender. 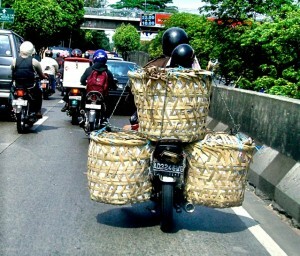 I also missed a great one when one went pass carrying 2 five foot rattan sofas on the back. Here is just a small sampling of what you would find everyday traveling down the streets of Jakarta and other cities in lovely Indonesia. Notice how many motorcycles there are in the first picture. Not only is one being used to deliver an extra wide load but there is another half dozen or so in this single shot. When we were in Solo we rode in a becak – that is a bicycle driven taxi. They are everywhere in smaller towns – they are not allowed in Jakarta. I love this first picture because it shows four types of transportation…car, bikes, small taxi call bjaja, and motorcycle. Notice he is carrying a ladder over his shoulders. If there had been a regular taxi in the picture it would have included just about every way people get some where without walking. The next picture was taken in Bali. 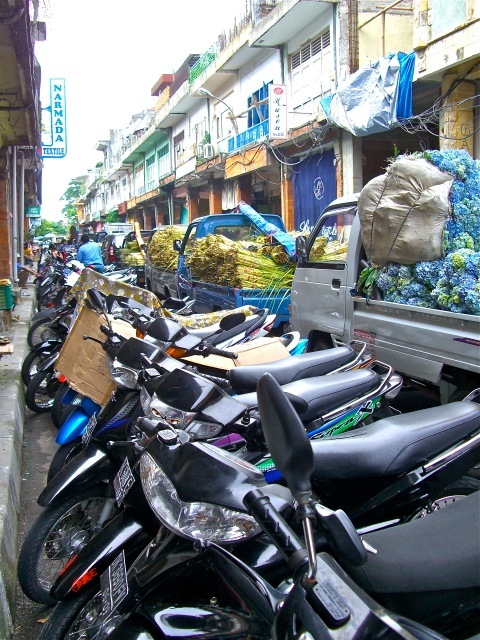 One side of the narrow street is packed with parked motorcycles and the other half is jammed with trucks trying to deliver produce and flowers. Green eggs and ham anyone. This motorcycle passed us and a little later we found it parked so I could get a picture of real green eggs. Maybe he is buying the ham? Can you imagine the mess if he happened to have an accident. The right hand picture shows the Indonesian version of a portable TV. I never did figure out just what the other bike was delivering in the old oil cans. I shot this picture out the window of our van and missed the top. But as you can see the driver is almost buried under his load. If you look closely you will see he even has more load sitting on his lap. Not an inch of wasted space. The last picture is two on a bike with three big baskets of something. I always have wondered if the hot exhaust pipe ever set the basket or what is inside of it on fire. This entry was posted in Mission - Indonesia on August 5, 2014 by Bill. I hope that we are alive to see the ‘prophecies of the last paragraph come to pass. The alarm went off at 5 but I did not crawl out of bed until after 5:30. We have to get moving because we need to leave by 7:15. I must confess that I was not looking forward to 5 hours of church meetings. However I had a very good time. We went to sacrament and part of SS at Tangerang 1. I did not get much out of first sacrament meeting because I could not hear very well. But they had the primary sing and that was special. I felt sorry for the missionaries because they did not have any investigators show up. Tangerang 2 meetings were great. It is a vibrant branch with a lot of PH. The branch president is much like I was when I was bishop. That is he gets right in and is part of his branch. He goes to SS and to PH and participates. He smiles a lot. We were asked to speak in Sacrament in two weeks – they will give us the theme. I actually look forward to doing this in Indonesian. Since the elders had two investigators, we went to Gospel Principles. The lesson was on the fall and Elder Roper was the teacher. I love Elder Roper – he is very spiritual and yet he always is smiling and enthusiastic – I will really miss him when he is transferred. At the end of the meeting I pointed out that Eve had to choose between two goods – something we are often faced with. After the GP meeting I mentioned to the branch mission leader that I had that calling until about 4 months before we came on our mission. He asked me if I had any words of wisdom for him. I challenged him to have the branch give a minimum of 10 referrals to the missionaries each month. I promised him if they would do that, then they would have at least on baptism each month. I think he took up the challenge – we will see if it works. PH was lively – I contributed a couple of points and Elder Roper and I shared favorite scriptures on prayer. I continue to try and learn Indonesian by reading from Gospel Principles – I am working on the section about prayer – and reading Kitab Mormon with Mary. Today we got back into the Isaiah verses. I have decided that he got paid by the word and that is why instead of just saying that Jerusalem and all it’s people would be destroyed, he went into great allegorical detail about what was going to happen to the Daughters of Zion. On most of the verses we did not even come close. I am ready to just skip them but Mary reminded me that in the last WW Leadership meeting Elder Packer said that we needed to read all of 2nd Nephi. So we have decided to read the next 20 pages in English. We decided to prepare beef stroganoff for dinner and that project turned into a comedy of errors. First we could not find the stroganoff mix that we knew we had bought. When we found that I put the water into the wrong part of the rice cooker and then realized that I had not washed the rice. Here in Indonesia you must wash the rice twice to get out the dust and other stuff. I learned this from Elder Subandriyo during our service project. After getting all this done and having everything ready to go, Mary discovered we are out of fuel for the stove. End of cooking stroganoff. (A note here – as I was typing this, I realized that the Leishmann’s kept an extra tank of fuel in the storage room. So we could have had stroganoff. At least we could have if I did not blow up the apartment changing the tanks. Tomorrow the fuel and water man – we are also on our last 5 gallons of clean water – will take care of all of this.) I had tomato soup and toast for dinner. Mary is still figuring out what she will have. Looking back it was a good Sunday. The highlight was the men choir that sang during sacrament in T2. I chickened out and did not join them but sat and enjoyed their singing. As I looked over that small group of humble PH holders standing shoulder to shoulder, the spirit touched me. These are the men – young and old – that will someday see Indonesia a fruitful place for missionary work. Some will live to see a temple built here. The strength of the Lord’s church is in the hearts and hands of these people. It is wonderful to be able to add even a little to the growth of the Kingdom through our missionary work. 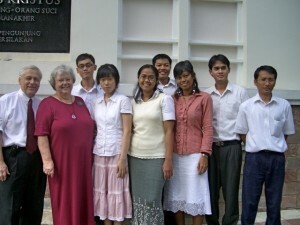 This entry was posted in Fort Lauderdale Mission, Mission - Indonesia on March 11, 2012 by Bill. As I was writing in my journal today I realized that it was time to end this journal. At least the daily postings of my journal. I will go through the thousands of pictures I have stored and post some with comments. People and events that I think are especially important that I think will add to the story that is told below. I also may start another blog dealing with the time we are home until we hopefully leave on our next mission sometime in January 2009. I hope that just one couple read these last 20 months of comments and experiences and decided that they would go on a mission. The need is so great that if tomorrow 5,000 couples sent in their papers it would not fill the openings for couple missionaries. The Jakarta Indonesian mission needs 7 couples before the end of the year. As far as we know there is only one coming. 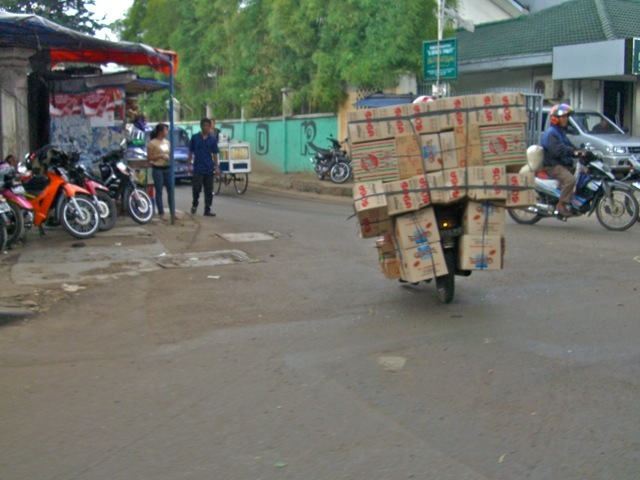 This entry was posted in Mission - Indonesia on June 7, 2008 by Bill. Our first full day as civilians was a busy and messy one. Busy because we started to unpack everything including the boxes that have arrived. Messy because most of it never got put away so it is in stacks around the house. My main tasks of the day was to try and neutralize the lingering odors. Other things that I accomplished was going to the store to get more small things we needed or desired such as light bulbs, diet root beer, and gasoline. This I did by visiting 3 stores including CostCo where I got a membership and the gasoline. Gasoline is $3.80 a gallon – that is about $1.20 more than when we left on our mission. Before I left to do the shopping I noticed that Mary looked very tired so I told her to just go back to bed and get some rest. Yesterday was very long and tiring for her and it is going to take at least two days for her to get her strength back. So for the rest of the day – at least until Jim came, she would stop and rest between other tasks. It turns out the washing machine is broken – at least the setting dial is stripped so you can not start the machine. We really need a new one so we decided that while Jim was here we would get a new one from Sears. I did walk around the yard and pull a few weeds. There is a lot that did not come back this year or perhaps it was last year. But the basic garden is still here so a month of hard work and buying new plants should bring it back to normal. I am not going to do too much because we will not be here for next year’s garden. Jim, Kristy, Olivia and Charlotte arrived about 5:30. They had stopped off at Cindy’s and Bob’s along the way. At first Olivia was not too sure about us, but within 20 minutes we were best friends. Earlier in the day I had bought a close-out graduation toy at Albertson’s. It is a bear dressed in robes and hat that when you turn him on dances and sings. That was the ice breaker and soon we were best buddies. While Jim, Kristy, and Mary got the makings for tacos going, Olivia and I went for a walk around the neighborhood. We stopped in at the Alexanders where once again it took a while for her to get over her shyness and then as we were walking home we saw Mitch Pratt, Mark Radmall, and Will Grace out in the Pratt’s yard talking about Harleys and stopped to say hello. Olivia was soon friends with them and the Pratt’s dog. One funny thing about our walk was when I introduced her and asked her to tell the people her age she would always say “I am 3 and a half” and show them how her light up hair barrette worked. As we walked into the cul-de-sac she noticed the two Tanner boys out playing and had to stop and say hi! We ended up playing with them for a short time. After Jim and his family went home, we finished cleaning up most of the kitchen and headed to bed. One thing that is really hard for me to get use to is that the sun does not set until almost 9 PM. For 18 months the sun was down no later than 6:30. A quick comment about the yard. I am writing this on Saturday morning and I am sitting here looking out the front window at the sea of green from the oaks, aspens, spruces and other trees. It is really beautiful. There is lots of green in Indonesia but the greens that are in my own yard are special. I really slept in this morning and so we did not get going as early as we should have. But everything worked out fine. After breakfast we headed off for the Victoria Peak tram ride. We took a taxi, the underground and then another taxi as the safest way there. There was a good size crowd waiting for the tram and they cram in about as many as they can. The ride is quite vertical and I was glad I had ended up standing with my back against a wall. Mary was not so lucky so I change places with her. There were so many people on the tram that it was hard to take any decent pictures. When we got to the top the view was pretty good – much better than it would have been yesterday in the rain – but it still was not clear enough to get a clear view around the island. It must be spectacular under clear, blue skies. We spent about 30 minutes looking all around and then took the tram back. I am glad we went but would not do it again unless it was a perfect day. The couples who live here probably wait for just the right day to go. I do not imagine it happens all that often here. The ride down did not have many passengers so I could take a lot of shots and will throw away those that do not work. When we got to the bottom the place was packed with people waiting to get a ride up and the line stretched out of the building. It is really a cash cow for whoever owns and runs it. We reversed our travels back to the hotel. Along the way we stopped and at a bakery/candy store where two small pieces of candy that Mary chose cost about $3.50 US. I tasted it and thought it was a rip-off. However my $1 pastry was great. Back at the hotel we changed into traveling clothes – that is a white shirt for me and a better blouse and skirt from Mary. Ate some goodies we had bought and then finished packing every loose thing. I was glad that we did not have to touch three of the big bags. It was bad enough packing one of them, the two carry-ons and my backpack. We were done in plenty of time and while we were waiting I found the hotel bakery that we did not know existed. It was probably a good thing because it had great almond partries that we did not really need to snack on. While waiting in line to check in at the airport, a woman started waving at me. I could not for the life of me place her and it turned out she did not know me. However she was part of a large group of mostly couples who were heading home from a 17 day tour of China who were almost all LDS. She had noticed my tag and was just being friendly. We talked to many of them as we wove our way through the line. I got in a number of advertisements for the need for couple missionaries. I doubt if I sold anyone who was not already sold but who knows. We are now about 2 hours into our flight and other than the entertainment programs will not work so there are no movies to watch, the couple in front of us are over 6’3″ and have pushed back their backs so far that they are basically in our laps, the air conditioning is not very good, and our reading lights do not seem to be functioning, everything is great. Most of the problems were worked out – well we could not shrink the folks in front of us – and so while the flight was long, it went by fairly rapidly and we landed at SF about 45 minutes early. Getting through immigration and customs went smoothly. We did have to wait a long time for our luggage and then had to push it for miles to the Delta counter. This was quite wearing on Mary but we finally made it. While waiting in line to go through security – it is certainly different here than anywhere else we have been including Hong Kong – we met a group of missionaries returning to the MTC after getting their visas at the French Counsel. They were a lively group and very excited about going on their missions. We found that we were sharing our flight with them while another group of 5 were going on another flight. I kidded them that the MTC had done that on purpose so if one of the planes went down there would still be some missionaries to send to France. We did not have to wait long and we boarded a small but very comfortable Delta commuter jet. After flying only big planes it was strange being in a plane with only 2 seats on each side of the aisle and where you could see from one end to the others. The flight went smoothly and I managed to get a little sleep. It was wonderful to see the Great Salt Lake and the blue skies. After years of pollution and overcast skies it is going to be strange to have good clean air. As we were coming off the plane a lady swooped down on us with one of the electric carts and whisked us to the down escalators. Truly a tender mercy because it was a long walk and something that we did not need at the time. As we walked towards the escalators Krista came running over to us and gave us a big welcoming hug. The rest of the group – Bob and Cindy’s families were at the bottom of the escalators with a big sign saying “Selamat Datang Rumah” – “Welcome Home” – at least close enough that we knew what it meant. There was a lot of excitement, hugs, smiles, and of course rapid talking. It was the first time that I really felt like we were actually off our mission and home. All the bags made it so we were soon heading to Bob’s house for some pie and conversation. Taylor drove our car and we rode with Bob in the Suburban. They left their Mustang so our old friend Ugh could pick it up some 2 hours later. What struck me most was the clear blue skies, the snow topped mountains (it snowed just a couple of days ago) and the lack of traffic. The traffic was light and it was not yet 7:30 when we drove out of the parking lot. Bob’s yard looks great and they have a new-used-free hot tub sitting on their patio. We sat around and talked some about our mission and caught up on a few things that were going on. Mary and I commented that it felt like we were coming home from a two week vacation rather than a 17 ½ month mission. I guess it will take some time to set in. The pie tasted delicious – we had been eating airplane food or fast foods for the last 30 hours. I had two pieces of berry pie. After about 45 minutes, Bob and I moved all the luggage into the Maxima and we headed home. Other than needing to stop for a moment and decide which was the right side of the street to drive on, everything went fine. The mountains continued to keep me in awe. I guess I had to be away from them for a long time before I appreciated them. I now know what Jim felt when he landed after his mission. Brian was home when we got there and the house was in pretty good shape. A few plants had died but that was expected. What was unexpected was the three cats that had not been trained to go outside. I quickly remedied that problem and they will either learn to be outside cats or they will not be able to stay. I imagine it will take at least 3 weeks before we know they are safe to let in at all. We spent part of the night cleaning out some of our luggage. Tom and Marilyn came over bringing delicious soup and bread sticks. We had a nice talk about what had been going on in the ward. Most Marilyn had told us about while we were gone, but some were new. While they were still here I called president Jackson so we could have our release interview but he was not home. So I then called president Esplin and he was not home but was down at the stake center so we said goodbye to our dear friends and to the Stake Center. It turned out that President Jackson was out of town but Presidnt Esplin and President Day was there. We said hello to Bishop Peterson – he did not remember that he moved in before we went on our mission. President Esplin interviewed us and then extended our release. We will speak to the High Council on the 15th. By the time we got home, Mary was beat so she heated up some of the soup and after eating that she went to bed. For some reason I was not really tired so I stayed up long enough to get on line through an unsecured wireless system and caught up on the e-mail. Finally at about 1:30 I went to bed. I thought I would read but after one paragraph I turned off the light and went to sleep. It was a long, long Thursday, but it was also a good one. We traveled safely, had no problem with luggage, and we had a part of our wonderful family to greet us at the gate. The Lord continued to watch over us and bless us. We had a very long but very nice sight-seeing day today. We got started a little late but once we got out the door we did great. The only real problem was that it rained from time to time and was overcast all day but we worked through that and did not let it bother us. First we took the Star Ferry over to Hong Kong Island. Then we took another ferry over to Lantau Island. The first trip takes about 10 minutes and the second took about 50 minutes. But in both cases we had a good time looking at the boats and skylines as we passed by or they passed by. This is one time when the weather did cut down on our enjoyment a little. We could not get a clear view of many things but we maybe we will the next time we come this way. On Lantau Island we took a wild ride on a bus to see a huge Buddha. It sits on top of a rather high hill. I went to the top and walked around and Mary plugged away at getting as high as she could. She made it about 3/4ths of the way before she decided she was through. I was proud of her because she could have just sat at the bottom until I was done. We then toured the shops that obviously cater to tourists. Mary found a great place to eat lunch – delicious noodles with vegetables and shrimp tempura – freshly cooked and very reasonable. Once we were filled, we took a cable car ride over the mountains to the other side of island. It was a fun thing to do but like the ferry ride it would have been better without the overcast. At one point we were buried in the clouds. We kidded about what would happen if we got stuck there. I am not sure how they might get us down. I took lots of pictures but most of them are rather poor. We just missed the bus to the fishing town of Tai O, but so did a nice couple from England so we agreed to share a taxi ride instead. They had been in Hong Kong since Friday and going home the day after we do. We talked a little but soon ran out of things to say. The trip only took about 15 minutes and cost about $1.35 US each. The part of the town along the river is built on stilts because the tide obviously rises and falls at least 6 feet and maybe more. Unfortunately we hit it at low tide and it looked rather sad. We walked through the shopping area that was only about 10% for tourists and 90% for the locals. The main thing for sale was of course varieties of dried and fresh caught things from the sea. I found a man making what I assumed was waffles but turned out to be something like donut holes only better tasting. He cooked them in a special pan over a small store run on charcoal. They were delicious and we ate them right down. We then wandered down the back street of the village that eventually became the only street. There was nothing commercial about it. I enjoyed the sights immensely. They made many of their homes out of metal sheeting painted silver. Further up the hill were some very humble and old shacks that people seemed to be living in. But the road we were on was fairly freshly poured concrete. There were no cars or motorcycles in the town – they either use boats, bikes or walk to get around. But the town is small enough that this works well. There was so many great things to see that it is impossible for me to describe even 5%. Every few feet there was something new to look at. One thing that is very different from Indonesia is how neat things are. Another is that the animals – cats and dogs – are fat and well taken care of. I have lots of pictures to post and share. I would love to go back someday with someone who speaks Chinese and talk to the people and take lots more pictures. The only thing that I can complain about was how hot it was. I sweated the whole time until my handkerchief was so wet that I had to wring it out a number of times. On our way out of the village we stopped and bought another sack of the delicious of treats from the vendor. I tried to get the name but he did not speak any English. Mary asked a man who was passing by if he spoke English and he said yes – but it turned out he did not know Cantonese because he was from the Philippines. But his friend did speak both and we found out they were called Egg Balls. Which made sense since that is what they looked like. While we were waiting for the bus to take us to the ferry dock, a young woman came up to Mary and introduced her as a member and gave us her e-mail address. You never know where you will run into a member, but as soon as they see our name tags, they know we are missionaries. The trip back to the ferry dock had one unusual feature. There were signs warning about cows being on the road. Since we went through only jungle or housing areas, I could not figure how there could be any cows. But sure enough we found bunches of them wandering on the edge of the road. Since the buses tend to really buzz along the road, it is amazing that there were not dead cows everywhere, but even with one calf having it’s dinner almost straddling the center line, we made it past them all safely. We took a fast ferry back to Hong Kong. This is a catamaran hull with hydro drive engines. It was very quiet and took half the time. When we got back to the docks in Hong Kong we could not decide what to do. We finally went looking for some place to eat and lucked into an inexpensive soup and sandwich shop that also had great pastries. By the time we were finished eating we were both ready to head back to the apartment. As we were walking back, the nightly light show that many of the buildings on both sides of the bay take part in started. It was nothing like Disneyland and we did not see any lasers being shot back and forth but we did see some interesting lighting effects on some of the tall buildings. We took the Star Ferry back to Kowloon and then a taxi to the hotel. We were both glad to get back, take off our shoes and relax. We watched Amazing Race Asia and soon after that Mary was asleep. I stayed up long enough to write most of this and then joined her. It was a good day of sight seeing and we even got to talk to a few people about the Church and what we have been doing over the last 18 months. 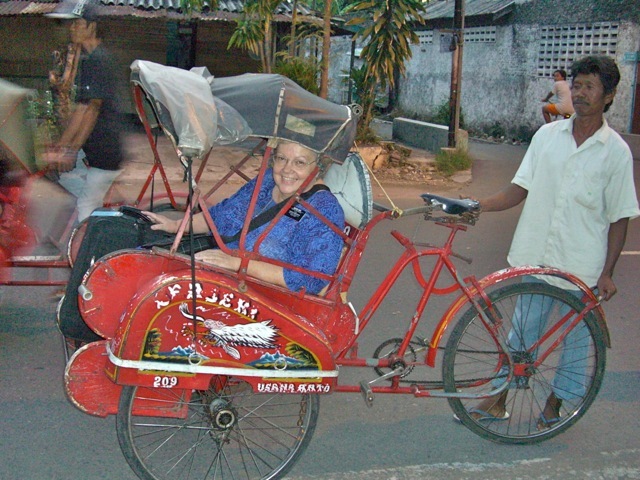 This entry was posted in Mission - Indonesia on June 6, 2008 by Bill. We both slept well and after a decent breakfast we left for the temple. We were once again lucky about our taxi driver because he knew the address and that it was a church. The Hong Kong temple is small but beautiful. The rich brown granite, the small but beautiful entry garden, and the simple but elegant main areas make it easy to feel the spirit. I felt right at home in the temple after not having the opportunity for 17 months. The temple workers all were very friendly and most spoke excellent English. Elder Pierce is serving a temple mission here from Utah – I did not meet Sister Pierce – and was our officiator. Sister Hallstrom – the Area President’s wife – was serving today. I did not see her but Mary did. They have five sessions on Tuesday. We went to the first one that started at 9:00. There were about a dozen women and seven men. We were invited to be the witness couple – something we have not done for many years. The session was in Cantonese but we had excellent translation units that were exactly in sync with the tape. The session went smoothly and I remembered most of the ceremony so that when we get back I can should be able to get back into serving in the temple without much reviewing. After the session I introduced myself to a young man who was in the session. Chris Mounteer had served in Hong Kong 5 years ago and had returned with his wife Mandy for a kind of second honeymoon. He told me what they had planned to do the rest of the day and I asked if he would mind showing us how to get to the Area offices on his way. When he said sure, he did not realize that they would end up being stuck with us all day. To keep it short, after going to both of our hotel to drop off my coat – where they had a chance to look at their e-mail for only the second time in a week – we went to theirs so they could change. Then a quick meal at McDonalds before going to the Area Offices. This took some walking and a long escalator ride only to arrive at what was the offices when Chris was here 5 years ago. Unfortunately it is now a museum. The offices move 4 years ago but a nice lady there knew where they had moved to. So we went there and met the Gibbons, Jaymi and renew our acquaintances with the Baldwins. The office building is nice and the offices bright and friendly. After visiting with them for a while and making some plans for tomorrow we went up to the 46the floor of a near by building and looked out at almost the whole island. Unfortunately it was still over-cast but what we could see was amazing. Then we caught a bus to the other side of the island where we went shopping in the Stanley area. The prices in Hong Kong are about 50% higher than Indonesia – at least in Jogya and Bali. We looked a lot but did not buy anything. After dark and in the rain we caught a bus back to the underground station and were soon back near their hotel. We said goodbye and thanks before they headed off for more shopping and we caught a taxi to our hotel. I had a short nap on the bus and so was not sleepy. Mary was exhausted – we had walked a lot – and went almost straight to bed. Mary had remarked earlier that while she had not missed the temple while we were serving, when she went in today she was struck by the spirit and how wonderful it was to be back in the Lord’s house. I did not feel that way as much as I felt like I was at home. The special brotherhood of those who serve in the temple spans the continents and oceans. It is a feeling that you have to be part of to appreciate. So as I spoke to Elder Pierce and saw him serve it was special. The comfortable feeling of the ceremony and the knowledge that it is true was there for me. It will be good to go to the Provo temple for a session but the same feeling was there this morning. The Lord blessed us through out the day. The taxi driver, meeting the Mounteers, having a woman at the museum knowing how to find the Church offices, and the rain not coming until we were through sight seeing. All these were tender mercies that made our day special. 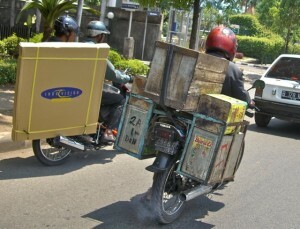 This entry was posted in Mission - Indonesia on June 3, 2008 by Bill. Just a short note from the Jakarta airport while waiting for the plane to take us away from this wonderful country. Neither of us could sleep so we were up before the alarm went off at 4:30. We packed our last things in our carry on and finished just in time to have Sam load them into the car. President and Sister Marchant woke early to say goodbye and take a final picture. We will miss their great hospitality and leadership. The trip to the airport was smooth sailing – tomorrow the toll road is supposed be flooded because of high tide but today it is high and dry. Perhaps this is our last tender mercy before leaving Indonesia. Our flight left on time, we had a nice meal, watched a show – The Spiderwick Chronicles – and got in a nap. We tried to watch another movie – Fool’s Gold – but for some reason about 10 minutes in it switched to Chinese or Korean and never got back on the correct track. But that is OK because it would have not ended before we landed. Going through immigration at the Hong Kong airport was a cinch – that is once we waited in line. But just before that a young woman walked up to me and looked at my badge. It turned out she was a member from Thailand who was returning from Japan. She had good English and I asked if she was going to go to BYUH and she said she would like to go to BYU Provo but BYUH would be great. I told her I would see what I could do to help. I thought I might get her in on the next Distant English Class. When Mary joined us I introduced my new friend and about that time an older woman walked up and was introduced as her grandmother. Mary said they had washed hands next to each other. It is a small world we live in. We had to wait for the bus to take us to our hotel. While we waited I went over and talked to another couple that was waiting. They were from London and we had a good talk about travel and how we served at our own expense. It turned out that her mother may rent to LDS missionaries but she was not sure. It was strange traveling on streets with little traffic and no motorcycles on the roads. Mary saw some parked but not many. Unfortunately it is raining as we travel so we can not see very much clearly. Hopefully it will be clear on Wednesday and Thursday. Our hotel is not in a very upscale location but the rooms turn out to be very nice and the club room is a nice place to sit and work. I have to go there because the internet connection in the room does not download – only uploads and they do not seem to have anyone who can solve that problem. Hopefully that will be worked out tomorrow. We thought we were going to go to dinner with a two of the couples but by the time we got checked in and figured out how to contact them it was late and we decided to just eat at the hotel and then go out walking to see the shops around the hotel and down off Nathan Road. This entry was posted in Mission - Indonesia on June 2, 2008 by Bill.